I awaken in a panic and spring upright in my sleeping bag. The contents of my stomach are desperately trying to escape. I frantically unzip the tent door and my head exits the door just as vomit sprays onto my shoes outside. The retched sounds are almost drowned out by the orchestra of the rainforest. This has been a reoccurring episode on this starry night. The growing pile of puke smells strangely similar to last nights dinner of moldy tamales, a gift from the settlers on the adjacent shore. I may never eat tamales again. It’s the first night of what some would say to be a poorly planned river trip. Yesterday my partner Claire and I launched our pack rafts on the Rio Bocay in Ayapal, Nicaragua. Like the phone lines and electricity, the road ends there. We are headed along the BOSAWAS reserve to the Rio Coco and eventually the Caribbean Coast of Nicaragua. We have packed enough food to survive for a couple of weeks. There are no roads out. In a sense; the river begins where the road ends. At the downstream edge of this bustling market town is a de facto harbor filled with hand dug canoes. Pigs squeal as they are weighed and tossed into a truck, while children happily splash in the water. Families have traveled several days by river from their rainforest homes to sell their crops, or unlucky native animals, and purchase luxuries from the outside world. The sun was setting when the bus dropped us at the far side of this frontier town; so we decided to stay the night and depart in the morning. At the gateway to the river there is a ramshackle checkpoint staffed with some bored looking soldiers. We try to be inconspicuous, which is impossible, and walk past. We didn’t exactly look into the need for permits and prefer to avoid the authorities altogether. The officials didn’t seem to notice as much as the local kids while we inflated our vibrant boats. Some little girls take our Alpacka boats for a cruise and we meet a mother, Helda, who has travelled, by canoe, four days upstream with her small children and brother. That night we share the river bank with them. We ate dinner at a shanty restaurant with “World Food Program” bags of rice in the corner. Helda prepared a dinner of boiled plantains, cooked over a fire at the rivers edge, there was a dessert of raw sugar. The smallest child, maybe 2 years old, begs for and receives a second handful. He delightfully licks his hands clean of every last sweet morsel. As the family prepares for bed by wrapping themselves in blankets and black plastic sheets we set up our space age tent with LED lights. They have been camping on the river bank for a few days; in the morning they will pack their canoe and head home. Their village at the Amaka river, a tributary to the Bocay is only a two day return journey down stream. I spend the second day trying to sleep the nausea away while wondering if we should retreat upstream and go on a relaxed beach vacation on the pacific coast. In the eddy next to our camp some young native, Mayangna, guys are putting the final touches on a new canoe. Their presence creates a stark contrast to the foreign settlers living across the river. Claire spends the day visiting the Spanish speaking homestead; Which consist of a couple of dirt floored shacks surrounded by stalks of corn and children. When we started on this journey we thought we would be mostly alone in an uninhabited jungle. We were very wrong! 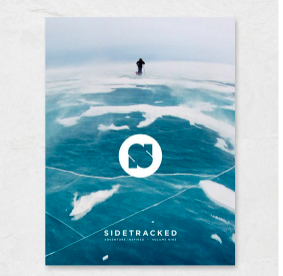 …TO BE CONTINUED…in Sidetracked magazine Volume 9.